Crohn’s disease is a type of inflammatory bowel disease (IBD) that causes swelling or irritation in the lining of your digestive tract. 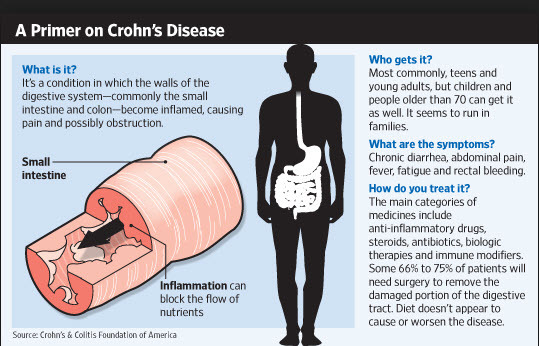 Crohn’s mostly affects the small intestine and the beginning of the large intestine. But it also can show up in any part of the digestive tract. This sets it apart from other IBDs. Crohn’s tends to run in families. It’s most common in people of Eastern European Jewish descent. Some people are diagnosed early, between the ages of 15-35. But the disease can hit someone of any age or ethnic background, and it affects both men and women. Currently, there is no one test for Crohn’s. One test that is used is the colonoscopy. This uses a thin, lighted tube to look inside your colon. Other ways include a CT scan or an MRI, which let the doctor view your whole digestive tract. Alternatively, there is the capsule endoscopy. The patient swallows a capsule with a tiny camera in it for this test. Physicians prescribe a mix of meds and lifestyle changes. This can help heal intestines and ease symptoms. Surgery may be necessary at some point. It won’t cure the disease, but it can get rid of the diseased parts of your digestive tract while saving the healthy parts. Keep track of what you eat so you can target problem foods.